Chinese herbs are an integral aspect of Chinese internal medicine. Chinese herbs are often take on a daily basis in order to prolong the benefits of acupuncture sessions. The Chinese material medica is over 2,000 years old and consists of over 500 individual herbs and 300 herbal formulas. Most of these herbs are roots, twigs, seeds and fruits of various plants. In modern practice, the acupuncturist identifies the client’s Chinese medical diagnosis and then chooses the appropriate formula for the condition, with modifications. This allows the acupuncturist to create a customized herbal formula that will address each patient individually. Formulas are often modified or changed based upon the patient’s progress and change of symptoms. 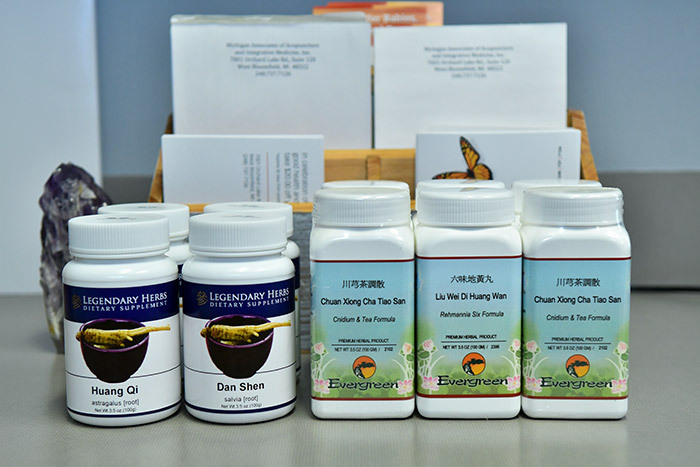 Michigan Associates of Acupuncture and Integrative Medicine uses granular herbs from Taiwan. These are a powdered form and offer a more convenient method of taking traditional Chinese herbs. The granules we use are from farms that abide by Good Agricultural Practices (GAP) standards. The quality of granule herbs is ensured by thin layer chromatography (TLC) and high-performance liquid chromatography (HPLC) by all of our suppliers. Patients mix granules in water and drink their herbs on a daily basis.